We interrupt your regularly scheduled post I was gonna put up today in favor of breaking news: Target's Cartwheel app is lying to you. You have the Cartwheel app, right? That nets you lots of extra discounts at Target? Okay, good. So earlier this week I saw that Cartwheel was offering 20% off C9 by Champion workout gear. Great! I need new running socks anyway. I carted myself off merrily to Target and began browsing. 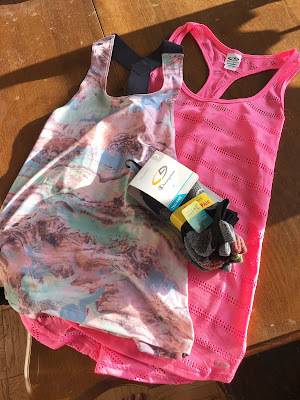 Post sock grab, I rifled through the workout clearance racks and found a couple cute tops. Cute tops are an important part of running motivation. I was about to toss it all in my cart when I saw the sign. It said: C9 by Champion, 20% off in the Cartwheel App! Yes, correct, good. I nodded. And then saw the fine print: does not apply to socks or clearance. DAMMIT. I looked at my haul, sighed, and put most of it back, save for one shirt that was already deeply discounted so it was still worth it. I paid for it along with some other stuff for which I did use Cartwheel, and upon checking my receipt later, I saw something interesting: the discount had indeed applied to my clearance item. Naturally the only logical thing to do at that point was go back to Target the next day, grab that other top I'd been eyeing plus the socks, and go through the checkout line again. Sure enough, the clearance top was 20% off! The socks: not, so that was legit. But I also had a Cartwheel offer for 5% off all socks, so I got a bit of a discount there too. $45 worth of stuff for like $20. I'm rushing to tell you this because these Cartwheel offers - 20% off C9 by Champion and 5% off socks, including workout socks - are good until October 8 and October 22, respectively. If you go between now and Saturday you could get some running gear for a steal too! I'm 99% sure all Targets run on the same Cartwheel system, so if I got 20% off clearance items you should too. A couple tips! Don't be afraid to look outside your regular sizes. I bought a tank in a small and one in a large and because of the way each is cut both fit fine. C9 has sock packs for $10 that are breathable, synthetic fabrics AND some come with a bonus fourth pair. They don't offer much compression, but wearing them on your shorter runs will take some of the strain off your fancier pairs. Do NOT buy the cold weather long pants. They fall down something awful. Although maybe that's just me being built funny. Run around in 'em before you take the tags off, is all I'm saying. There you go. Now go get some cute workout stuff for a metaphorical song!